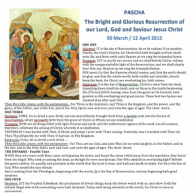 These bulletins provide the Epistle and Gospel readings with a homily for the Sunday dates given below as well as a brief Lives of Saints for Saints for each day. Due to limited server space we will only display the current and previous month on the site so please feel free to download your own copy. If you wish to subscribe and have the bulletins emailed to you on a monthly basis please click here to subscribe. The Sunday Matins Gospels (known as the "Matins Resurrection Gospels") are an eleven-week cycle of readings taken from the Gospel accounts of the Resurrection appearances of Jesus.